Large scale submarine playset that fires projectiles and includes 3 poseable figures, a speedboat, tank and many more accessories! Features lights and sounds. Length 70cm. Batteries included. Control panel not included…. This toy costs approximately £34.99 (for the latest and best prices make sure you check our retailer list for the Soldier Force Submarine Playset above). 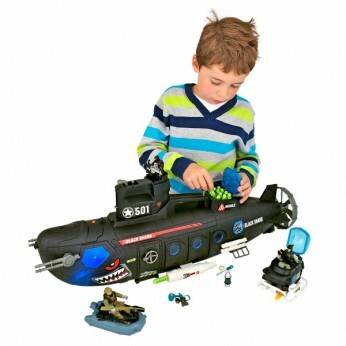 In our review of Soldier Force Submarine Playset we classed it as being suitable for ages 6 years, 7 years, 8 years but recommend you check the manufacturer specific advice before purchasing.